The What: Altinex has begun shipping the Neutron MT312-104 Digital MultiTasker Control Card that is primarily designed for use with the MultiTouch family of touch panels for boardrooms, lecture halls, and the like. It is designed with sensory inputs to control any third-party equipment, and provides a wide array of possibilities in designing audiovisual systems when combined with the power of the AVSnap software. The What Else: The MT312-104 is equipped with two bidirectional RS-232 ports, two IR ports, two relay ports, and two sensor ports. When MT312-104 is combined with 12 or 20 slots of enclosures, it provides nearly unlimited control options and system design flexibility. The relays can be used to independently control lights, screens, shades, and system power, while the sensor inputs trigger events based occupancy, noise, light, video, and audio sensors. They can handle up to 1 amp at 30V DC and can be programmed as momentary or latching relays. The RS-232 ports are equipment agnostic and can control any type of equipment with various baud rates from 9600 to 115K. The sensor inputs will respond to contact closures and voltage outputs from other equipment. The threshold is programmable to accommodate specific sensor. The two supplied voltages, +12VDC and +24VDC add additional flexibility when configuring sensor inputs. The Bottom Line: The MT312-104 combines the necessary functions to design and implement small and large AV systems. 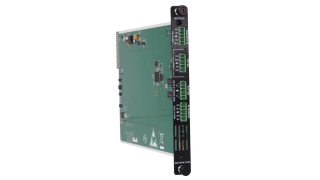 Just like other MultiTasker cards, the MT312-104 must be installed in an enclosure to provide a complete control system. The Neutron MT312-104 Digital MultiTasker Control Card is available now with a MSRP price of $250.